Unfortunately due to the lack of parking we can not offer dolphin watches. Please check back with us next summer! WE ARE STILL OFFERING OUR FISHING CHARTERS IF YOU’RE INTERESTED! 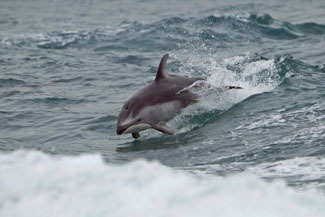 Experience life like never before with dolphin-watching trips from Dockside Seafood & Fishing Center in Virginia Beach. Sunset cruises on Virginia Beach last approximately an hour and a half and depart nightly. Trips will run Memorial Day thru Labor Day on Tuesday, Wednesday, Thursday and Sunday evenings only. Heading down the coast toward the historic Cape Henry, you’ll get the chance to see dolphins in action interacting with one another. These sunset dolphin-watching cruises are not only enjoyable, but very historic. Cruise the very waters that the English settlers traveled before landing in 1607. Navy warships and commercial tankers entering or departing the bay and the Chesapeake Bay Bridge-Tunnel are also visible on our sunset cruises. According to the Virginia Department of Tourism, the Chesapeake Bay is “one of the best birding spots in the state”. Bird watchers from around the country plan yearly pilgrimages to tour these waters to see the many different species. Contact us for more reservations, pricing, or for more information on dolphin watching trips in Virginia Beach and the Chesapeake Bay area.